In there four incisive and keenly perceptive essays, one of out most celebrated and respected historians of modern Europe looks at the world situation and some of the major political problems confronting us at the start of the third millennium. With his usual measured and brilliant historical perspective, Eric Hobsbawm traces the rise of American hegemony in the twenty-first century. He examines the state of steadily increasing world disorder in the context of rapidly growing inequalities created by rampant free-market globalization. He makes clear that there is no longer a plural power system of states whose relations are governed by common laws--including those for the conduct of war. He scrutinizes America's policies, particularly its use of the threat of terrorism as an excuse for unilateral deployment of its global power. Finally, he discusses the ways in which the current American hegemony differs from the defunct British Empire in its inception, its ideology, and its effects on nations and individuals. Hobsbawm is particularly astute in assessing the United States' assertion of world hegemony, its denunciation of formerly accepted international conventions, and its launching of wars of aggression when it sees fit. Aside from the naivete and failure that have surrounded most of these imperial campaigns, Hobsbawm points out that foreign values and institutions--including those associated with a democratic government--can rarely be imposed on countries such as Iraq by outside forces unless the conditions exist that make them acceptable and readily adaptable. 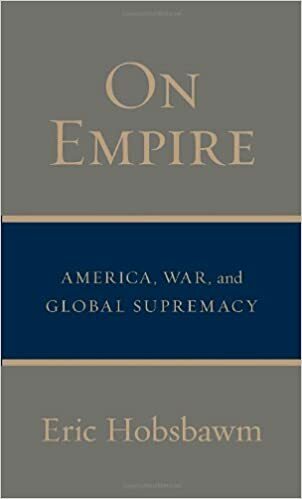 Timely and accessible, On Empire is a commanding work of history that should be read by anyone who wants some understanding of the turbulent times in which we live.